ChasingTreasure.com Jewelry Boxes Blog: Diamonds: How Did a Tiny Stone Become So Valuable? Diamonds: How Did a Tiny Stone Become So Valuable? Of all of the gemstones all over the world, none have had a history comparable to that of the diamond. Ancient Sanskrit and Buddhist texts refer to the precious stone, especially to the strength and brilliance. The texts refer to the fact that the diamond was a useful tool for metal working, but the texts do not mention cutting or wearing the stones. For centuries, diamonds continued to be used around the world as a tool. Most of the diamonds today come from African mines, but prior to the early 1700’s, most diamonds came from India. When Indian diamond traders reached China, the Chinese commented on how the diamonds were worn to protect the wearer from evil spirits, but the Chinese used the strong stone to cut their precious stone – jade. Eventually, as the Indian diamond traders depleted the cache of stones in their country, people began looking for diamonds elsewhere around the world, and mines were discovered in Brazil and South Africa in the 1700s and 1800s, respectively. Even though diamonds were used all over the world, they were regularly used for engraving and in some cases for ornamentation. The first true diamond cutters were in the 14th century in Germany and today, there are only a few places where diamonds are cut for the purpose of wearing them as ornamentation. The first record of anyone giving a diamond as an engagement ring was in the late 15th century when the Archduke of Austria, Maximilian I, gave a ring to Mary of Burgundy, but this did not create the furor that came later when DeBeers created the marketing campaign that changed the wedding industry forever. DeBeers is the company that has been responsible for bringing diamonds to the left hand of women all over the world for nearly 100 years. This company first began working in diamond mines to help remove water when a diamond over 80 carats was discovered on the company’s property. The founder of the company, Cecil Rhodes, then invested the profits from this monstrous diamond to buy more land for mining. Eventually, the company dominated the diamond mining landscape and today DeBeers is involved in not only mining for ornamental diamonds, but for industrial diamonds in mines all over the world in places like South Africa, Canada, Namibia, and even in deep sea mines. The company is one of the wealthiest companies in the world and it has been involved in many controversial business practices. However, the company staked its place in the hearts of millions when a marketing copywriter developed the phrase, “A Diamond is Forever.” This phrase turned an industrial stone into a stone that symbolizes commitment, trust, and love. Since then, DeBeers has also been able to keep the popularity and price of diamonds high with other marketing campaigns like the eternity ring with a circle of diamonds, the past-present-and-future ring with three diamonds, and the right-hand-ring for women who do not want to marry. 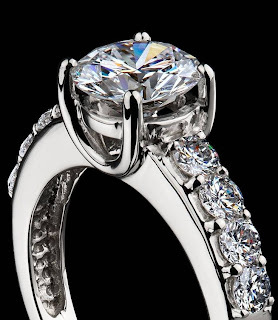 It is amazing to think of a world without diamonds, or at least without diamonds on left hand ring fingers. Thank you DeBeers, for making our world a prettier place to be. When you get your diamond jewelry, the best place to store it is in a jewelry box from ChasingTreasure.com.